Animals, Plants, Flowers, Gambling, Shopping, Birding, Sports... all of these are "entertaining." But there is more. Beginning in the 1970s Jim Guercio's Caribou Ranch Recording studio was used by hundreds of musical groups including Chicago, The Beach Boys and Elton John. The studio is not operational now but its legacy lives on in the music and entertainment culture of the area. Most nights of the week you can find live entertainment nearby; some of it surprising good. 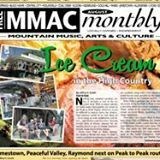 There is so much available that a comprehensive free monthly guide, Mountain Music, Arts & Culture is published for the Idaho Springs to Estes Park Region. MMAC is available throughout the Peak to Peak. I got my copy at the Nederland Visitors' Center. In the Summer a separate Summer Events pull out section accompanies the monthly MMAC. Several churches including Catholic, Presbyterian and Calvary Chapel have services in Nederland. A more complete list is available here. Several organizations such as Shoshoni Yoga Ashram provide contemplative environments and sessions . More information is available in local publications such as the weekly Mountain Ear Newspaper and at the Visitors' Center in Nederland.